Pre-order on DVD from Amazon for only $8.78. "From learning the true meaning of sharing and friendship in “Sharing the Rocketship,” to realizing how great it is to spend time with family in “Rollie Racers,” “FUN AND GAMES WITH CAILLOU!” is packed with wonderful summertime adventures the whole family can enjoy! In addition to featuring the following six fun-filled learning adventures, the DVD also includes special features – coloring pages and activities. “Sharing the Rocketship” -- Caillou and Leo come to realize the true meaning of “sharing” when they purchase a toy rocket ship together. “Coach Grandpa” -- When Grandpa takes on the job of soccer coach, Caillou comes to realize his grandpa is proud of him – no matter what! “Shoe Story” -- Caillou realizes new isn’t always better after coveting a pair of snazzy light-up sneakers. “Rollie Racers” -- Caillou realizes how great it can be to spend time with family, instead of spending all his time playing with “Rollie Racer” toys." This new DVD is filled with some great episodes which have already aired on television, but are favorites of fans of the show. As a parent, I love the different lessons preschoolers learn, and how the stories are simple enough to understand, even for younger viewers. From learning the importance of family, sharing, keeping your word, and so much more, children will love the episodes that make up this new DVD. And, at under $9.00, you can't go wrong picking up a copy for the house or car, as well as one for the grandparents house. 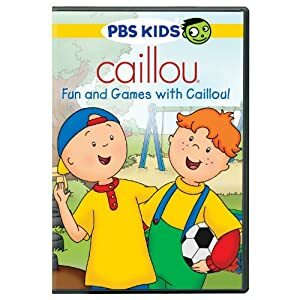 Caillou has been around for a long time, and see it being around for years to come either through on-air shows or DVDs like this one. Pre-order on DVD from Amazon for only $6.96. "Lovable characters, charming plotlines, humor, and science all come together in the fun and engaging program PEEP and the Big Wide World. From learning about mud, to exploring the many uses of a drinking straw – blowing bubbles, breathing underwater, spying on Quack – “PEEP DISCOVERS” features our favorite chicken uncovering more and more about the Big Wide World! In the adventure Fair Shares, Peep and his friends encounter a problem – two crackers, divided by three birds, equals one big headache. In Marble Mover, Peep discovers that if you ever need help getting a marble up a hill, all you need to do is “Ask a Duck.” In addition to featuring eight fun-filled learning adventures, this DVD includes printable activities and coloring pages. All the stories on this DVD are available in English and Spanish! PEEP and the Big Wide World gives wings to the innovative idea of teaching science to preschoolers. Set in and around a pond, a bush, and a tin can, the show follows a newly hatched chicken named Peep, and his friends Chirp and Quack (a robin and a duck), on their adventures. Surrounding them is a large urban park – a place of great wonder and mystery, a place they are forever eager to explore, a place they call “the big wide world.” The program is narrated by Joan Cusack (“Toy Story 3”)." Savannah has finally gotten Bella hooked on this show, so we are now playing catch up by watching other Peep and the Big Wide World DVDs we own, as well as watch the ones I had downloaded their Leap Pads. Even though we have only had this DVD for a few days, the girls have already watched it half a dozen times. Each of the fun-filled adventures that make up this new DVD will entertain children, while peaking their curiosity and teaching them about new things and words. I love watching my girls shout out to the television and try to tell Chirp, Peep and Quack what things really are, or how to get something done. And, just listening to them giggling at stories, makes me smile. "The first TV series inspired by the iconic, award-winning MISTER ROGERS’ NEIGHBORHOOD, DANIEL TIGER’S NEIGHBORHOOD, from The Fred Rogers Company, stars 4-year-old Daniel Tiger, son of the original program’s Daniel Striped Tiger, who invites young viewers into his world, giving them a kid’s-eye view of his life. As they closely follow and share Daniel’s everyday adventures, preschoolers ages 2-4 and their families learn the fun and practical strategies and skills necessary for growing and learning. One of the key ingredients that sets the series apart is its groundbreaking use of catchy, musical strategies that reinforce each theme and that preschoolers and parents will both sing – and use – together in their daily lives. DANIEL TIGER’S NEIGHBORHOOD, which debuted on PBS KIDS in September 2012, airs Monday-Friday (check local listings). “DANIEL TRIES SOMETHING NEW” will be available on DVD July 15, 2014. The DVD run time is approximately 100 minutes and its SRP is $12.99. Filled with new experiences such as a trip to a restaurant and the first day of school, this new DVD features engaging tales that are fun-filled and educational. Today is Teacher Harriet’s birthday! Mom Tiger helps the kids surprise Teacher Harriet by decorating the classroom with streamers and making a birthday present while she is gone. The kids learn that cooperation is necessary to complete this big project!" I grew up like many children watching Mister Rogers Neighborhood. And, then when I started babysitting, I would share this wonderful educational series with the children I was watching. I never would have thought years later that I would be able to share Daniel Tiger's Neighborhood with my own children, and let them experience similar fun that I grew up enjoying from the Fred Rogers Company. Have you seen this new animated series, which airs daily on PBS Kids? If not, and you were a fan of the Mister Rogers Series as a child, this is one show not to be missed, if you have preschoolers or young children. You will be happy to see characters from the beloved original series now brought to life in a fun animated way. Thanks to the kind folks at PBS Distribution, two lucky readers will win one of the three above new releases (winner's choice), to enjoy with their child(ren). To enter, please complete the entries on the Rafflecopter form below. Good luck! I'd like the Daniel Tiger DVD if I won. Oh Carter would love the Daniel Tiger DVD! He loves that show!